Picked up a sitar a while ago. I tuned it but the sympathetic strings were a problem, I never managed to tune them and ended up breaking one. 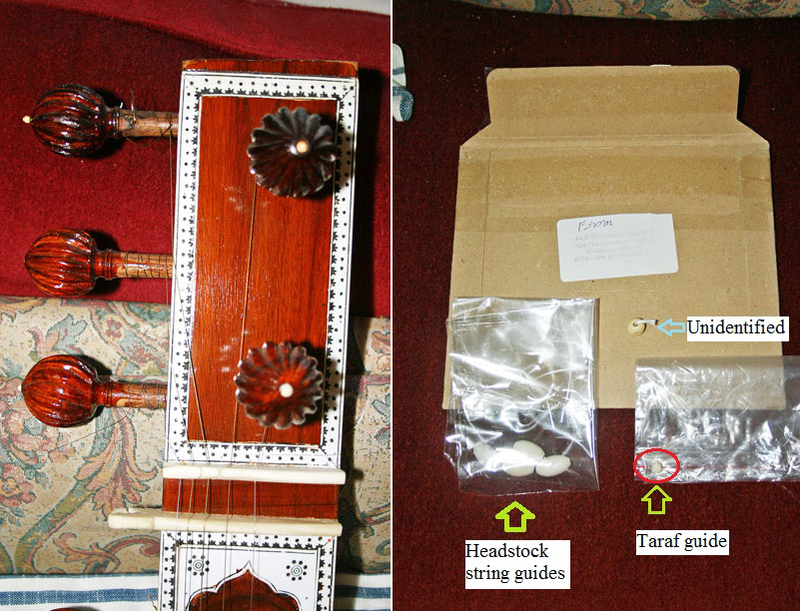 Then I moved home, the sitar - minus a sympathetic string - has been storage ever since. Like to get the sitar up & running again but will need a lot of advice please, especially tuning the sympathetic strings. Is it possible to tune all sympathetic strings to a single note - for a drone effect - or is there another way to tune them? Here is one way to tune the sympathetics in the key of C#. This is for 13 strings, though you can use 11 or 12 if you prefer. This works for both Vilayat Khan (Ghandar Pancham) and Ravi Shankar (Karaj Pancham) style. The #1 sympathetic string is the first small tuner up by the headstock. #13 is down near the neck joint. Work slowly and take your time. There is an excellent video by Musician’s Mall on how to string a sitar. Please watch it a couple times before you start. Good luck. Have saved your post & will keep for reference. 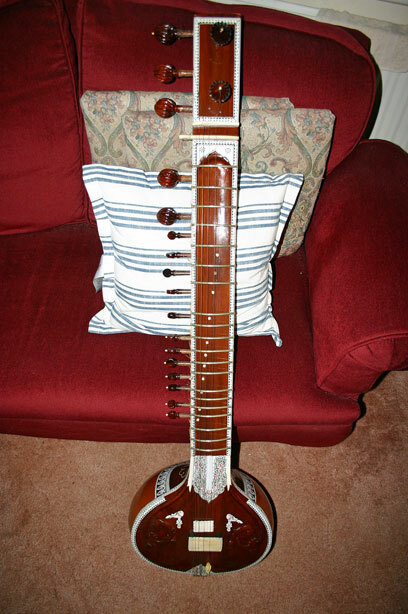 May also take the sitar to a music shop to have it re-set up, it is a long time since I first took delivery of it. I think it needs completely re-stringing, it was set up without the ceramic string beads originally, although these had been supplied separately, when delivered. Here's an interesting point re what swar to tune taraf to. When 'we' tune ours we tune the final longest taraf to either NI/NI komal or whatever note PRECEDES the Middle SA !!! So when you strum them all, you end the whole set by hitting the CHIKARI so, certainly for me anyway, you get a very nice intro to the raag ?!!?? It's like saying 'Here I am now' !!! Thank you, I do not use these aps. In Western tuning the sitar seems to be broadly in the key of C# but Ravi Shankar tuned to C, I understand? Last time I tuned the sitar I tuned C sharp I think, the strings felt too lax otherwise. The Chikaris were always the most difficult to tune. Ravi-Ji used to mix up his music with ALL kinds of musics & musicians. He removed his PA chikari so he mix up all kinds of weird & wonderful stuff !!! No PA to overshadow or 'restrict' raga mixing !!! I'd consider tuning all chikari to C# since that is the overall key, it would also create a nice sympathetic drone? "I'd consider tuning all chikari to C# since that is the overall key, it would also create a nice sympathetic drone?" Did you mean "tarab"? The chikari are supposed to be tuned to C#. The idea of tuning all the tarab to one note will not achieve the results you want. 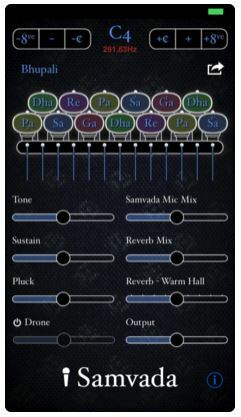 The nice drone is created by the different tarab strings tuned to the corresponding notes of the raga. If you want simplicity use drafting tape to mute the strings. Drafting tape because there is very little glue on this kind of tape. Many student sitars omit the tarab just to make things more simple. But in the beginning playing the sitar is hard. Hard and often painful. But stay with it, use pillows or sit on the edge of the bed and try not to cut your fingers and you will come through the initial phase just fine. Tuning is one of the most important things with this instrument. Don't let anyone tell you not to use a tuner. Use one to help your ear to learn the tones. "Snarks" works great and you can attach one to your chikari kunti (the tuning peg). all the strings are there (tarab). If you broke one it's okay. If one or two or three or even four are giving you trouble, i.e. slipping just take them out and get the other strings right. Tune it and tune it and tune it again. PRS used to say that tuning the sitar was an art in itself. Good luck and don't be afraid to ask questions.The sitar requires a lot of patience. Broke a tarab & the retainer fell out, that's when I stopped. But it is crazy having such an awesome instrument around and not using it. I must upload a photo, if this site will allow. I'd like to change all the strings but they tangle at the bridge, looks daunting - also the upper, white string-guides were never attached when new, the ones which sit at the top of the tuning head. I have a Burns tuner which is very good, if battery-hungry. No mostly he played in C#. Instead of the above charts you can also tune the tarafs (Low to high) NDSS and then continue going up until high Ga. Both ways are good. It's a matter of taste. Need to glue that tarab retainer back in place, it is tiny, I have kept it safe for over 5 years; then mute the tarabs, then tune the main strings & see what happens. Photos to follow. As you can see, the string guides are missing at the headstock although they were supplied separately on purchase. Have saved the taraf guide, I need to glue it back in position. The other item marked 'unidentified' has probably come off one of the tuning pegs.